I love it when my students send me pictures of finished work from classes I have taught as I don’t often get to see the finished product. The above ‘Michelle’ pillow is Karmen Sunshine’s from a class I taught in Atlanta. It is made from hand dyed wool and accented with a great polka dot fabric. 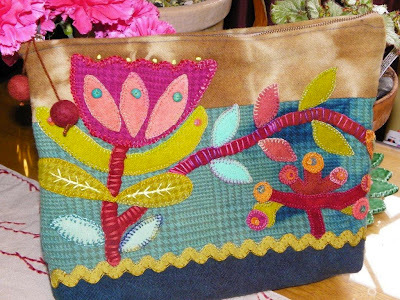 The Wild Tulip Bag was a kit from my CD series which Teresa Fritzley embellished wonderfully with her own fibers, roving balls and beads. I love teaching at ‘Out of Hand’ in Calgary Canada. Last year we worked on ‘Greenbrier’ in a two day class and Wendy Sells just sent me pictures of her great piece made from silk and cottons all done on the sewing machine. I am sure you will admit this piece is wonderful! 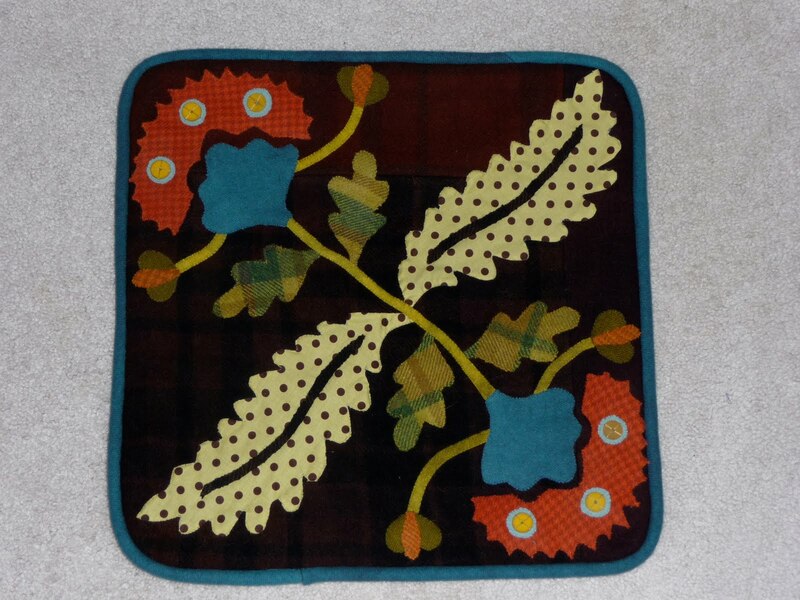 I love to see pieces made in other fabrics beside wool and also machine done instead of handwork. It just shows with a little bit of imagination my patterns can be done in any medium. Please keep sending me photos I love to share what each one of you have been creating. I am in Spokane spending time with Jason and my family as he is on spring break. I have also been working on my ‘Workt by Hand’ project which I am so happy to say is nearly complete. My goal was to have the new book ‘Robin Run the Hedge’ to the printer and by WBH project complete before I leave for Barcelona and Nantes on April 11. The book went to the printer yesterday and my project is nearing the end. It does feel so good to be on target! I have just returned home from a wonderful teaching trip in Colorado. I stayed at my friend Andreas home and was delighted to see all her projects she had made using my CD ‘Folk-art Dreams’ by Electric Quilt. It is a really fun product with about 180 blocks on it that can be changed to any size you desire. The above pillow is a block from my ‘Mercer Lane’ quilt and the small quilt below is the center of ‘Uniontown Square’. 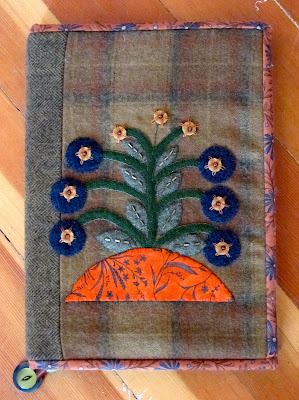 She also used a block from my book ‘Greenbrier’ to make this journal which she embellished with beads. This is the little ‘Lea’ bag which is great to hold small notions, rug hooks or pencils. I just love this pillow! Last year I taught for my friend Kerry in Salt Lake City and they all embellished this block from my book ‘Magnolia’. Andrea put it together as a pillow using a wonderful beaded trim around the edge. The class I taught was my ‘Altered Texture’ and loved all the embellishment techniques each student tried using wonderful threads and stitches. 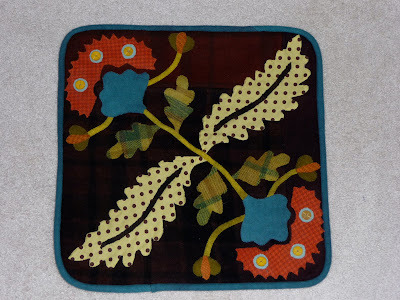 The velvet rick rack and fabric just gives great texture to this piece. 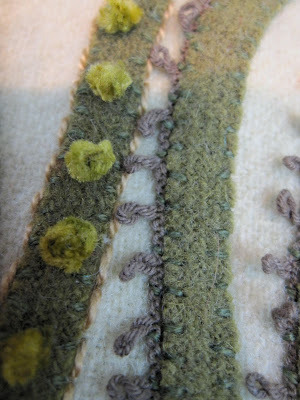 These variegated threads give wonderful depth to this edging. Don’t you just want to touch this fern. I love her use of three different fibers to get this result. These Heishi beads are stacked with different beads adding more dimension. 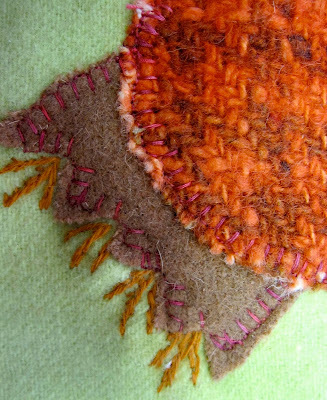 These leaves are layered and them embellished with a closed fly stitch using seagrass and embroidery floss. I find this all so inspiring! I hope to spend the day doing a little stitching myself. What a wonderful creative weekend I spent at NEORQC this past weekend. I had 16 students in class and everyone pushed the limits. I am sure you will agree once you view their work. As it was a weekend retreat we had more time to concentrate on each element in our piece. They used a journal to record ideas and we all shared with each other. I taught my Altered texture class which emphasizes individual creativity. I provide wonderful embellishment fibers and fabrics for purchase and help each person think outside the box. Great textural berries and flowers. Use of fabulous yarns, seagrass and beads. A wonderful variety of flowers were created. Some using fussy cut fabrics, beads and buttons. Here is a fly stitch with a bugle bead. Hand Dyed silk velvet. What wonderful texture. Couched yarn with my son Jason’s hand stamped metal tags. 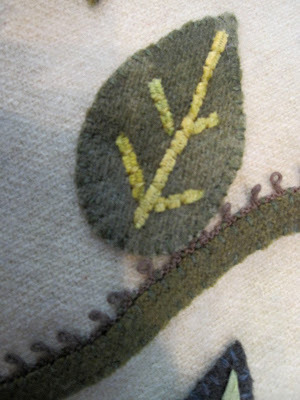 Silk leaf with feather stitch. We experimented with a variety of stitches, threads and beads to embellish the stems. Velvet rick-rack couched and embellished with french knots. Wonderful lace on the vase. Below Darlene chose to put this tag on her piece to record her embellishment journey. A class like this always inspires me to learn more. I have been stitching every day since I get home. My head is spinning with great embellishment techniques and fibers. My hands just don’t work fast enough to do all the creations in my head. I just had to share some pieces with you that I have been working on. I have been having a great time creating with our hand dyed threads and beads. 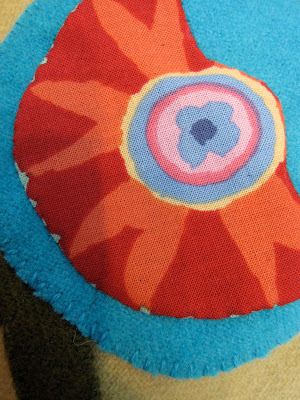 I love the little fly stitch which was introduced to me while teaching in Melbourne, Australia by one of my students. Here I used hand dyed #8 perle cotton and wonderful seagrass which is now one of my favorite threads. I love how using different fibers gives you a variety of looks. Here I have used a metallic thread and hand dyed floss for a coral and a Pekinese stitch. They give such depth to the wool. I also have some stranded Japanese flosses which I love because the variegation is short and you get instant textural gratification. Here I have done a chevron stitch as well as bullion knots. I have a great bead book which I have been experimenting with and love this coral stitch done in silk thread with seed beads.